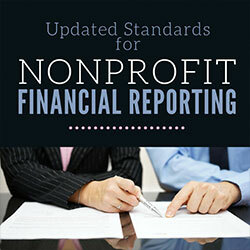 On August 18, 2016, the Financial Accounting Standards Board (FASB) released Accounting Standards Update (ASU) 2016-14 changing the way nonprofits prepare their financial statements. FASB’s overall goal in solidifying these changes was to improve financial reporting for nonprofits so that outsiders can more easily understand the organization’s financial position. FASB accomplished this goal by changing the net asset classifications, enhancing the statement of cash flows, clarifying information regarding liquidity and availability of cash, simplifying the reporting of investments, and adding consistency across organizations on reporting expenses by function and nature. Under the new Standards, FASB attempts to ease confusion over the net asset nomenclature by completely changing the names of the three existing net asset classifications. “Unrestricted” net assets will now be termed “Net Assets without Donor Restrictions”. Both “Temporarily Restricted” and “Permanently Restricted” net assets will be renamed “Net Assets with Donor Restrictions”. Any Board of Director designations, such as funds that are “restricted” by the Board, will need to be fully disclosed – including listing the purpose of the restriction and the amount. Organizations will also have to disclose the type, purpose, and amounts for all donor restrictions. Endowments will be included in “Net Assets with Donor Restrictions” and any underwater endowments will need to be disclosed by listing the current fair value of the endowment less the original value of the donation, as well as the organization’s policy regarding appropriating funds from these underwater endowments. Nonprofits will now be able to use either the direct or indirect method of reporting cash flows. Previously, nonprofits who used the direct method had to provide the indirect method as well; however, under the new Standards, this additional reconciliation will no longer be required. Thus, FASB is allowing organizations to use the method that is most beneficial to the organization as opposed to mandating one methodology over another. Under the new Standards, FASB is now requiring nonprofits to provide a qualitative description of how the organization manages its resources in order to meet liquidity needs and manage liquidity risk, as well as a quantitative description of the financial assets available for general expenditures within one year of the balance sheet date. (A financial asset being cash, evidence of ownership interest in an entity, or a contractual agreement with another entity that clearly shows the organization’s intent to receive cash or an exchange of a financial instrument). Organizations should note that an untapped line of credit does not meet FASB’s definition of a financial asset. Essentially, FASB wants nonprofits to disclose how much the organization has available at the date of the balance sheet to meet cash needs for one year. As this change will affect all organizations and will be the most onerous of the changes implemented by ASU 2016-14, FASB is not requiring organizations to provide comparative information in the first year that these Standards are implemented. Under the new guidance, organizations will now have to report net investment returns on the Statement of Activities. Thus, external costs for investments plus all direct internal costs associated with the strategic and tactical activities involved in generating investment return (such as salaries, benefits, travel costs, and other costs associated with staff who are responsible for the development and execution of the organization’s investment strategy) will be netted against the actual investment income listed on the Statement of Activities. These expenses will therefore not show up under “expenses” but in “revenues”. Lastly, one additional change made by ASU 2016-14 is the requirement that all organizations complete a Statement of Functional Expenses as part of their annual financial statements. This information can be presented as a standalone Statement, on the face of the Statement of Activities, or in the footnotes. Due to the change in the reporting of investment returns (described above), investment expenses should not be included in the Statement of Functional Expenses. In addition, FASB is requesting that organizations disclose how the organization allocates costs among program and support functions. For example, if rent is allocated to programs based on level of effort, this specific methodology should be disclosed in the footnotes so that readers do not assume these costs appear solely in General and Administrative Costs. During the first year that these Standards are implemented, FASB is not requiring organizations to provide comparative information on the Statement of Functional Expenses. ASU 2016-14 is effective for fiscal years beginning after December 15, 2017; thus, for most organizations, the financial statements starting in 2018 will need to be prepared using the new Standards. However, FASB is allowing organizations to adopt the new Standards earlier, and, according to most auditors, early adoption should be exercised specifically by organizations that currently have “underwater” endowments. FASB is currently considering additional changes to nonprofit financial reporting which are expected to address standard operating measures; however, no timeline has been set by FASB for deliberating these proposed changes. Given the fact that ASU 2016-14 is FASB’s most comprehensive revision to nonprofit financial reporting since FAS 116 and 117 issued over 20 years ago, nonprofits should expect additional changes to come as FASB attempts to improve overall nonprofit financial reporting.